This dish would make a beautifully elegant dinner for two served with a nice green salad and crusty bread. There should be enough left over for a wonderfully quick and delicious lunch the next day. Roast tomatoes, onions and 8 cloves of garlic at 425°F until the edges have browned [~30 mins]. Add the raw garlic, bouillon, olive oil and almond meal. Liquefy in a blender. Transfer to a pot on the stove top over medium heat and stir in the sliced olives. Bring to a low simmer and then reduce the heat. Let it perk away while you are cooking the pasta. Once the pasta is done, taste the sauce for seasonings and add salt and pepper to taste. Drain the pasta and toss in the sauce. 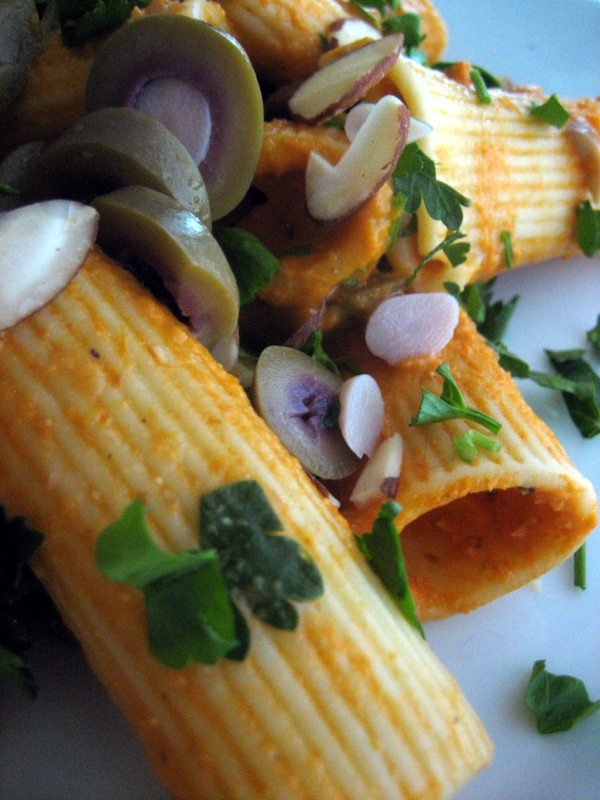 Garnish with sliced almonds, olives and parsley. I hear ya, jd! I’m an olive lover as well and they add just the right amount of saltiness to offset the sweetness of the almonds. I was looking for Olives Nutrition and found your site. Thank you for the recipe. I cant wait to try it at home!